Mark Twain once said, “Age is an issue of mind over matter. If you don’t mind, it doesn’t matter.” Well, Mark Twain probably never had spider veins and didn’t have to worry about wearing shorts – or a bikini at the beach, unlike more than half the women in the U.S. If you’re one of them, don’t worry though! We may not have the fountain of youth handy yet, but we can give you some proven remedies to get rid of spider veins. This is easily the most effective way to get rid of spider veins. You’ll need to go to a vein doctor for this, who will inject a medication into the affected vein. This causes the vein walls to scar, stick together and seal off from within. Sclerotherapy uses really tiny needles for injection, so the procedure is virtually painless and can be done as a day procedure. You can go back to work the same day! Sclerotherapy helps with appearance as well as symptoms of spider veins, and you can start to see results within a week after treatment. This is an advanced form of sclerotherapy that our vein doctors in NY and NJ employ to treat bigger and bulging forms of spider veins. This involves injecting foam into your veins, which will cause scarring and sealing. Varithena also gives quick results. When applied over spider veins, laser energy can destroy the veins and remove them. Our vein doctors in NJ and NY prefer to use this when the veins are very small or located on parts of the body where sclerotherapy is difficult. It works well in combination with sclerotherapy, and is generally done to eliminate the last few veins after sclerotherapy has already been done. Laser only improves cosmetic appearance. It doesn’t help with symptoms, and can cause burning or tingling of the skin that is exposed to it. The results become apparent in a few months. Support stockings (or compression stockings) push blood from your veins back to your heart. While these do not help with the cosmetic appearance, they can give you relief from symptoms caused due to spider veins – like aching feet and leg cramps. Do remember that these stockings aren’t one-size-fits-all; You should get fitted for custom stockings at a spider vein clinic. Exercise stimulates your leg and calf muscles, and squeezes blood out from your legs. Like support stockings, this can help relieve symptoms. Exercise (and compression stockings) can go a long way in preventing spider veins from re-appearing once you’ve had them treated already using sclerotherapy or lasers. If your job needs you to sit or stand for extended periods of time, you’re prone to blood stagnation in your legs, which can cause you to develop spider veins. So to relieve symptoms, and prevent spider veins from recurring, remember to put your feet up for at least fifteen minutes a day. Elevating your legs allows blood to flow back to the heart, relieving pressure in the leg veins. 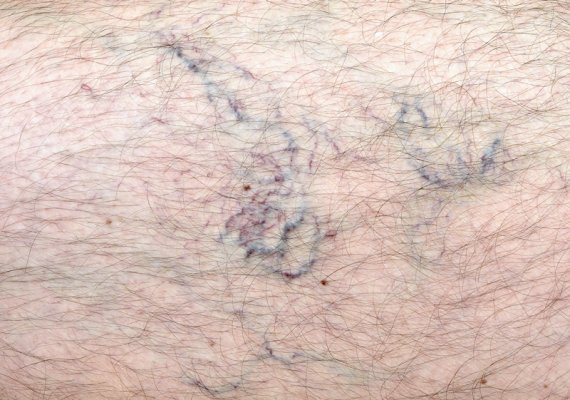 If your spider veins formed due to unhealthy veins deeper within the leg, it’s necessary to treat those veins first. This situation is like a leaky pipe within a wall, where the unhealthy veins inside are like a leaky pipe, and the spider veins are stains on the surface of the way. If you repaint the wall without fixing the leaky pipe, the stains will inevitably reappear. Radiofrequency Ablation is a minimally invasive way to treat the saphenous veins, problematic veins that lead to the majority of spider vein formation. In Radiofrequency, where heat energy is applied to your blood vessels in order to remove them. The spider vein doctor will numb the area, make a small cut on your skin, and insert a catheter into the affected vein. This heats and destroys your vein from within. Like Radiofrequency ablation, Laser ablation is used to unhealthy veins just below the skin that cause spider veins to form. Laser energy is applied from within your veins to seal them off. This is an alternative to radiofrequency ablation, and follows the same method, except that a laser fiber is used instead of a catheter. This procedure is equally effective, but may be associated with slightly more discomfort during the procedure. Surgery isn’t normally needed for spider veins, unless you have severe symptoms of chronic venous insufficiency, like skin ulcers. In this case, the vein doctor may need to remove the entire vein surgically. Well, technically, this isn’t a method that ‘removes’ your spider vein problem. But if they’re small, painless, and don’t bother you too much, just apply some self tanner or foundation – and you’re good to go! So, which of the ten remedies should you go for? With all the options available, it can be a challenge to choose the best vein treatment that suits your problem. Our board certified top-notch vein specialists can help you choose the right treatment – or a combination that would work for you. With our vein treatment clinics in multiple locations, we’re always on hand to answer your queries and offer the best care available.